Over the last few decades, Antarctic ice shelves have been disintegrating at a rapid rate, likely due to warming atmospheric and ocean temperatures, according to scientists. New research reveals that one type of threat to ice shelf stability might be more widespread that previously thought. A study recently published in EGU’s open access journal The Cryosphere identified several regions in Antarctica were liquid seawater could be leaking into vulnerable layers of an ice shelf. Scientists have known for some time now that seawater can seep into an ice shelf’s firn layer, the region of compacted snow that is on its way to becoming ice. This seawater infiltration presents an issue to the ice shelf’s stability, since as the seawater spreads throughout the firn layer, the water can create fractures and help expand crevasses already present in the frozen material. Past research has shown that the presence of liquid brine from seawater within an ice shelf is correlated to increased fracturing and calving. While ice shelf collapse doesn’t directly contribute to sea level rise, since the ice is already floating, stable ice shelves often push back on land-based ice sheets and glaciers, slowing down ice flow into the ocean. Past research has suggested that once an ice shelf collapses, the rate of ice flow from unsupported glaciers can greatly accelerate. To better understand Antarctic ice shelves’ risk of collapse, the researchers involved with this new study sought to identify where ice shelf firn layers are vulnerable to seawater infiltration. Using Antarctic geometry data, they mapped out the potential ‘brine zones’ within the continent’s ice shelves. These are regions of the ice shelf where the firn layer is both below the sea level and permeable enough to let seawater percolate through. 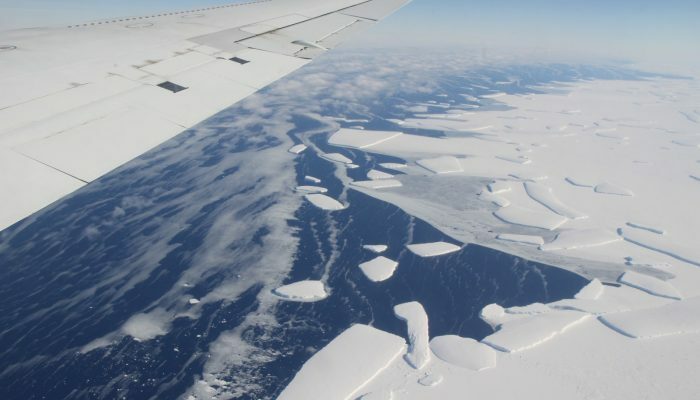 The results of their analysis revealed that almost all ice shelves in Antarctica have spots where seawater can potentially leak through their layers, with about 10-40 percent of the continent’s total ice shelf area possibly at risk of infiltration. The researchers compared their estimated points to a map of previously confirmed brine zones, observed through ice cores or radar surveys. After reviewing these records, they identified only one record of brine presence that hadn’t been highlighted by their developed model. The study found many areas in Antarctica where seawater infiltration could be possible, but has not been previously observed. The findings suggest that this firn layer vulnerability to seawater might be more widespread than previously believed. The researchers suggest that the most likely new regions where brine from seawater may be present includes the Abbot Ice Shelf, Nickerson Ice Shelf, Sulzberger Ice Shelf, Rennick Ice Shelf, and slower-moving areas of Shackleton Ice Shelf. The regions all contain large swathes of permeable firn below sea level while also subject to relatively warm air temperatures and low flow speeds, the ideal conditions for maintaining liquid brine. The study points out that there are still many uncertainties in this research, considering the unknowns still present in the data used for mapping and the factors that may influence seawater infiltration. For example, some areas that have large predicted brine zones have an unusually think layer of firn from heavy snowfall. This is the case for the Edward VIII Bay in eastern Antarctica. “Our results indicate the total ice shelf area where permeable firn lies below sea level, but this does not necessarily imply that the firn contains brine,” the authors of the study noted in their article. 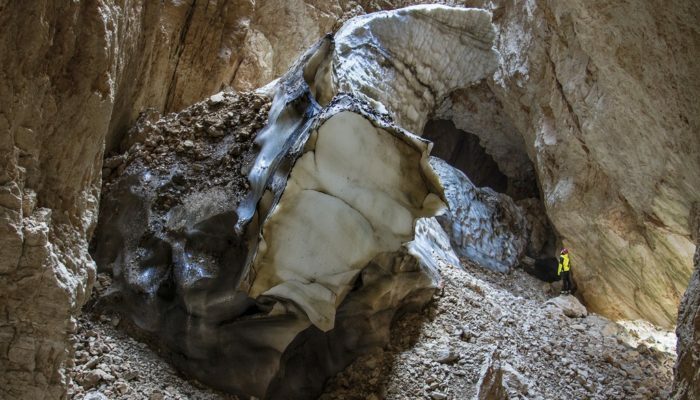 Given their findings, the researchers involved recommend that this potentially widespread influence on ice shelves should be further examined and assessed by future studies. 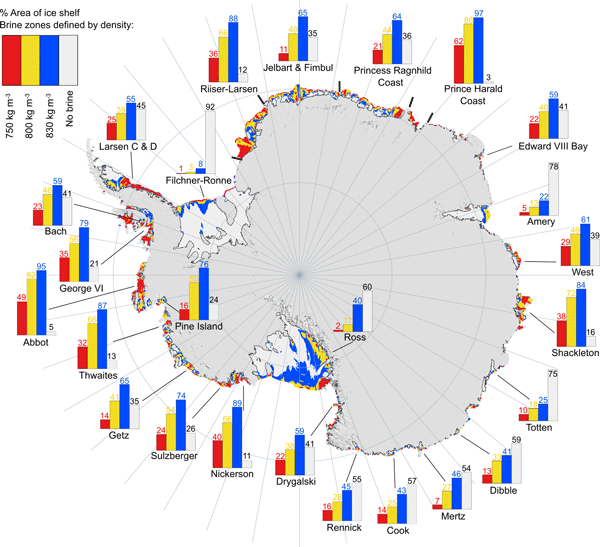 Cook, S., Galton-Fenzi, B. K., Ligtenberg, S. R. M. and Coleman, R.: Brief communication: widespread potential for seawater infiltration on Antarctic ice shelves, The Cryosphere, 12(12), 3853–3859, doi:10.5194/tc-12-3853-2018, 2018. Scambos, T. A.: Glacier acceleration and thinning after ice shelf collapse in the Larsen B embayment, Antarctica, Geophysical Research Letters, 31(18), doi:10.1029/2004gl020670, 2004. Scambos, T., Fricker, H. A., Liu, C.-C., Bohlander, J., Fastook, J., Sargent, A., Massom, R. and Wu, A.-M.: Ice shelf disintegration by plate bending and hydro-fracture: Satellite observations and model results of the 2008 Wilkins ice shelf break-ups, Earth and Planetary Science Letters, 280(1–4), 51–60, doi:10.1016/j.epsl.2008.12.027, 2009. Pictured here is a snapshot of an environment in transition. Today’s featured photo was taken at the foot of Monte Fitz Roy, a jagged Patagonia mountain located in Los Glaciares National Park on the border between Argentina and Chile. The Patagonia region in South America is the second biggest source of glaciers in the southern hemisphere, behind Antarctica, but the region is losing ice at a rapid rate. 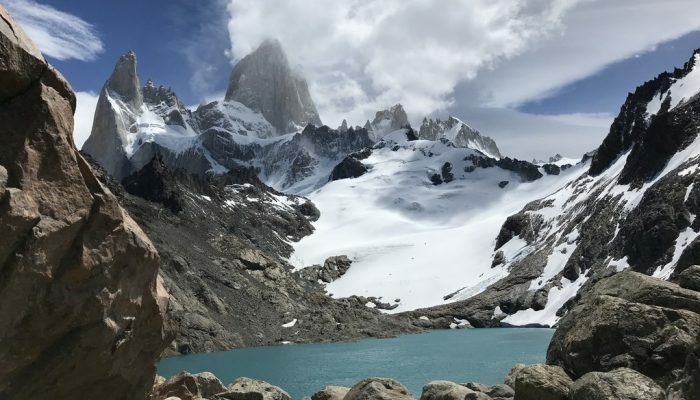 Satellite imagery analysis over the last few years has suggested that the Patagonia region is losing ice more than any other part of South America, with some glaciers shedding ice faster than any place in the world. 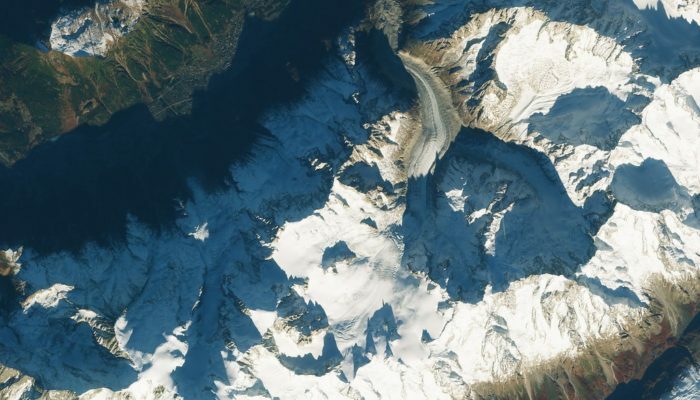 A recent study reported that the northern and southern Patagonia ice fields in particular are losing roughly 17 billion tons of ice each year. Los Glaciares National Park alone is home to around 50 large glaciers, but because of warming temperatures, almost all of these large ice masses have been shrinking over the last 50 years. This level of glacial ice loss can be hard to fully imagine, but in 2017, Shauna-Kay Rainford, a PhD student at Pennsylvania State University in the United States and photographer of this featured image, got a first-hand glimpse of Patagonia’s changing landscape.